Acting Chief Koeppen joined the Village’s Fire Department in 1980, was promoted to Fire Lieutenant in 1995, and promoted to Fire Commander in 1998. In 2005, Ken Koeppen was promoted to Deputy Fire Chief. The Arlington Heights Fire Department of 110 employees provides residents and businesses with fire protection service, emergency medical services (EMS) and other rescue functions. The Department consists of four Divisions, Administrative, Fire Suppression, Emergency Medical and Training. 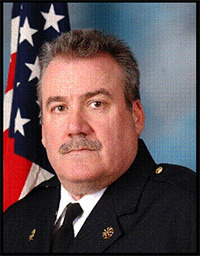 In December 2004 Ericksen, was promoted as the fourth Fire Chief since the Arlington Heights Fire Department changed from a Volunteer Department to a full-time paid Fire Department in 1958. The Village of Arlington Heights announced the job opening for the position of Fire Chief earlier this month. Fire Chief candidates must have ten years of increasingly responsible experience in fire suppression and EMS — including five years as a Fire Chief or second in Command in a Fire Department. A Bachelor’s degree in Fire Science, Public Administration or related field is required or an equivalent combination of education and experience sufficient to demonstrate the ability to successfully perform the essential duties of the job. The Village seeks an individual with integrity and strong communication skills as well as experience in employee relations. In addition, demonstrated abilities in strategic planning, budgeting, and organizational development are needed. A minimum commitment of five years is sought. The position is appointed by and reports to the Village Manager. Koeppen was on the scene prior to arrival of firefighter/paramedics about 6:50 p.m. Thursday, December 12, 2013 when Arlington Heights Police Officer Michael McEvoy was shot in the face while responding to a call for a “man with a gun” in a townhouse condominium near Arlington Heights Road and Palatine Road. Koeppen is credited with helping save the life of officer McEvoy, who was bleeding severely from the gunshot wound (The Cardinal Officer Down: Arlington Heights Police “Go to Guy” Is Down, Back-Up Officers and Deputy Fire Chief Rescue Him, Brothers Support Him). Koeppen happened to be in the neighborhood when he noticed flashing lights from police cars that were arriving to the shooting call. Koeppen rushed to McEvoy’s side to provide first aid in the yard in front of the condominium, where an active shooter was still inside. Koeppen is quick to point to the police officers that also saved McEvoy’s life — saying their actions were amazing. Koeppen was highly complimentary of all involved, including the first firefighter/paramedics that arrived. From a perspective of the initial seconds of an emergency unfolding, such as the shooting of the police officer, Koeppen concluded that the system of police, firefighters and paramedics in an emergency is extraordinary.